The candidates who are applied for the Junior Engineer post. 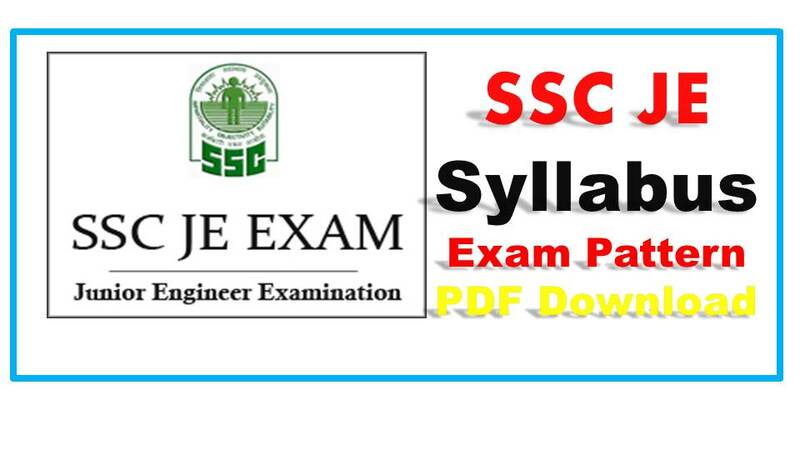 Need to prepare well the Candidates in preparation time they require Exam Pattern, Syllabus, Model Question/Previews year Question papers, Related Books and what is the Exam Pattern of SSC Sub Engineer written test (Tier1 and Tier 2). Below this post we are providing the all information detailed. Staff Selection Commission conducts the SSC Junior Engineer (Test) Exam. The Test will consist of two papers. First Paper Consist of Objective Type Questions, Second Paper is Descriptive Type. We are given the Exam pattern According to the Previews Year Exam. In the above table SSC Sub Engineer Exam Pattern for Paper I is Objective type Questions. There is a negative mark on each and every question.0.25 marks will deduct for each wrong answer in Paper I. General Intelligence and Reasoning Syllabus: in this Section Candidates can answer the 50 Questions each question having one mark Total 50 marks. Aspirants can stay this section in 15 Minutes. Each question time having is approximately 18 seconds. General Awareness Exam Syllabus: in this Section Candidates can answer the 50 Questions Total marks per this section is 50 marks. JE Syllabus for these two sections classified below. Analogies. Similarities. Space Visualization. Problem-solving. Analysis. Judgment. Decision making. Visual memory. Discrimination. Observation. Relationship concepts. Arithmetical reasoning. Verbal and figure classification. Arithmetical number series. Indian Constitution. Science – Inventions & Discoveries. History. Budget and Five Year Plans. Geography. Important Financial & Economic News. Economy. Scientific Research. Culture. India and its neighboring countries. Sports. Knowledge of Current Events. General Politics. Current Affairs – National & International. Economy, Banking, and Finance. Countries & Capitals. etc. General Engineering: it depends on the Branch (Electrical/Mechanical/Civil). In this area candidate can answer the 100 questions. Engineering Mechanics. Engineering Materials & Constructions. Surveying & Measurement. Mechanics of Solids. Transport Phenomenon. Engineering Economy & Management. Elementary Engineering. Energy Conversion. Environmental Engineering. Structural Analysis. Structural Design. Hydrology & Water Resources. Soil Mechanics & Foundations. The design of Hydraulic Structures. Open Channel Flow. Transportation Engineering. Hydraulic Engineering. Public Health Engineering. AC Fundamentals. Utilization of Electrical Energy. Power Systems. Power Electronics & Drives. Network Theory. Electrical Machines. Basic Electrical Engineering Concepts. Analog and Digital Electronics. Magnetic Circuit. Estimation and costing. Measurement and measuring instruments. Basic Electronics etc. Machining and Machine Tool Operations. Staff Selection Commission JE Paper 2 is descriptive type. In this area candidate gain Maximum 300 Marks. Candidates can stay in this section in 60 Minutes. 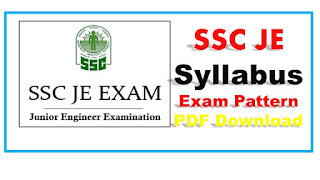 SSC Sub Engineer Call Letter/ Hall ticket released 10-15 days before the written test. Written test date is May be 5-8 Jan 2018. SSC JE Admit card 2017 released in last week of December 2017. The Cut off Scores for Junior Engineer (JE) will be decided by SSC (Staff Selection Commission) and then all the Candidates are appearing for the Exam will have to secure the set marks to qualify the Exam.SSC JE cut off marks declared online along with result. Here we giving the previous year Junior engineer cut off marks list it will helps you how to prepare this year (2017-2018) JE Notification. All the best for all applied candidates. Staff Selection Commission Has Announced the JE (Sub-Engineer) results after completes the written examination process. SSC JE 2015 Final Merit list is given here.